Goat Cheese from Spain Try Goats cheese with paprika or Goat cheese with Rosemary or perhaps a Hamper. A whole round of medium-textured Spanish goats milk cheese with the rind rubbed in olive oil and paprika, giving a fragrant pepperiness and colour to the cheese. With a Denomination of Origin (DOP) as a mark of its quality. Weight 1kg. 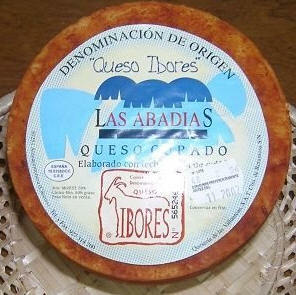 A small round of medium-hard pasteurized goat’s milk cheese from Murcia, weighing a minimum of 500g. This is a mild-tasting goat cheese, coated in fragrant rosemary leaves; the combination of these two flavours makes a great cheese, fantastic on a mixed cheeseboard, in a picnic, with our delicious fig and almond wedges, or served with apples at lunchtime. Goat Cheese is an ideal present. Cheese-making enthusiast, and member of the Going Goaty Cooperative, Nori Gordon shows us how she makes soft goat’s milk (chèvre) cheese. In this demonstration she is using raw goat’s milk from her goat (the milking duties are split amongst the members of the cooperative), though as Nori says in the video, you can use pasteurized goat or cow’s milk instead of raw milk if you prefer.